2 and a half years ago I launched messivsronaldo.net, and 12 months ago I wrote a substantial article about how it had performed after the first 18 months. This is a follow on to that article to show the [considerable] progression of the site since last October. I was delighted with the site at this time last year but I never would have predicted the significant continued growth that has occurred in the past 12 months. A hell of a lot. I actually surprised myself when I looked back on last year’s article and realised that when it was written, the site was still in its one page format – more or less as it was when it was first launched. These changes have all added to the experience this website provides, but some have been particularly beneficial in increasing the pull this site has to user’s seeking information. 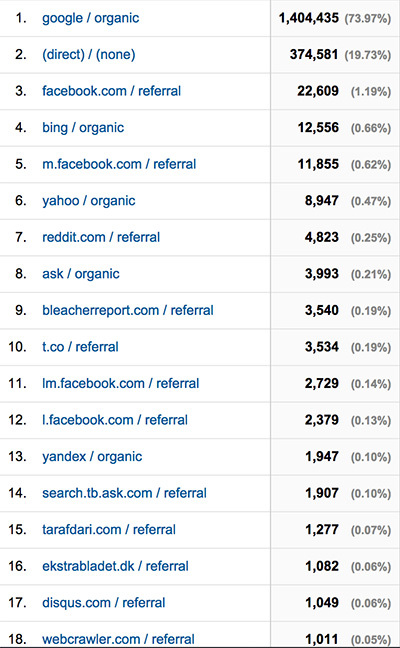 The Records page and the Calendar Year Stats page receive a particularly large amount of visitors direct from searches. The site is still updated manually, which when you consider how much has been added may seem like a nightmare to maintain, but I’ve tried to make it as manageable as possible. Data such as the all time stats and most of the record figures are simply set at the start of each season and then added onto the current season totals, so they look after themselves. Only at the beginning of each season do these areas require attention. And I’m not adverse to putting a bit of effort in once a year! In terms of updating the current online uk slot games with each and every game, it’s actually an effortless process these days. Last December I began a 3-month stretch travelling around New Zealand in a campervan, so I really needed a way of quickly updating the site on-the-go without having to power up the laptop and find some Wifi. Fortunately, I found an app that has proved perfect for my needs and which has increased the speed & efficiency with which I update the stats. With Touchqode I can simply download my stats.php file on my phone, update the numbers and re-upload! It takes seconds. This means that most of the time, I can update the site literally seconds after a goal is scored which I believe has profound effects on the perceived credibility of the website. When I published my review this time last year it was off the back of the site’s best ever month. Coincidentally, it’s the same story this year! But let’s start this section as we did last year by looking at the overall numbers since the site was launched in April 2012. At this point last year, the site had received 788,119 visits – now the overall figure sits at 2,673,529! 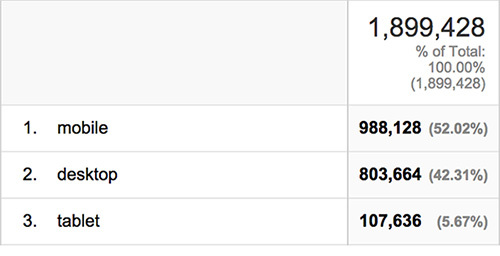 That’s not far short of 2 million visits in the last 12 months alone! This averages out at over 5,000 visits a day, a huge increase on the average for the previous 12 months (Oct 2012 – Oct 2013) which was 1,850 visits per day. However, in the early stages of this season the site seems to be showing signs of moving up to another new level as 5 figure daily visit totals are becoming increasingly regular and all-time highs are being smashed every other week. The last 30 day period for example has seen a staggering 351,845 sessions and several days with over 20,000 sessions – even surpassing 30,000 a couple of times. This time last year I was talking about the site’s first 30 day period to surpass the 100,000 views barrier! It’s also interesting to note that 2 thirds of users are returning visitors as opposed to new visitors – the exact reverse of this time last year. Last year I listed the site’s top 10 days in terms of numbers and stated the possible reasons for the traffic. Below shows an updated list, with the numbers in brackets showing the top 10 figures from this time last year. The previous night, Ronaldo scored his 3rd hat-trick in just 15 days, equalling the all-time La Liga record. The previous day, Messi scored 2 and assisted 2, and Ronaldo scored 1. The previous day, Ronaldo scored 4 goals in a single game. Messi scored 2 and assisted 2, and Ronaldo scored 1. Ronaldo scored his 3rd hat-trick in just 15 days, equalling the all-time La Liga record. Ronaldo scored a hat-trick for Portugal in a World Cup play-off match to ensure their qualification. Ronaldo scored 4 goals in a single game. Ronaldo scored a brace the previous day. Possibly boosted by excitement for the Ballon d’Or which was awarded to Ronaldo the following week. 2 days previous, Messi scored 2 and assisted 2, and Ronaldo scored 1. The day of the 2014 World Cup final in which Messi and Argentina featured, but ultimately lost to Germany. Evidently, the numbers are a lot more impressive in this year’s chart compared to last year’s! Interestingly, 7 of these top 10 have come in the last month, largely thanks to Ronaldo’s extremely impressive start to the season. Furthermore, the 10th best day for the site at this point last year was 5,068 visits. You may recall from an earlier paragraph that the past 12 months have actually averaged more than that per day! At this point last year, the website had 15,735 Facebook likes and 1,638 Facebook comments. The “Like” count has more than doubled since then, now sitting at 37,831, whilst the comments count is now at 3,811. As a side note, the poll that I added to the “Have Your Say” section at the end of October last year has received 210,411 votes (Ronaldo currently has 55% of the vote!). 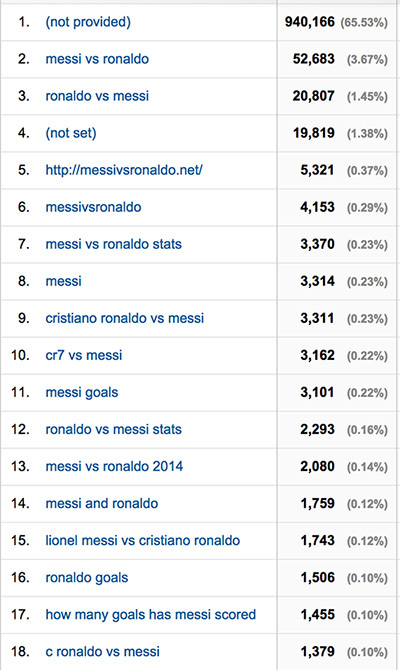 In terms of traffic sources, I’m pleased to say that messivsronaldo.net is very self-sufficient in that it generates a large majority of its traffic organically. There are lots of referral sources but these numbers are tiny when put against the numbers brought in through Google and through direct access. One interesting referral that doesn’t bring in a lot of visitors but that I imagine would possibly improve your site’s credibility in the eyes of Google is Wikipedia. 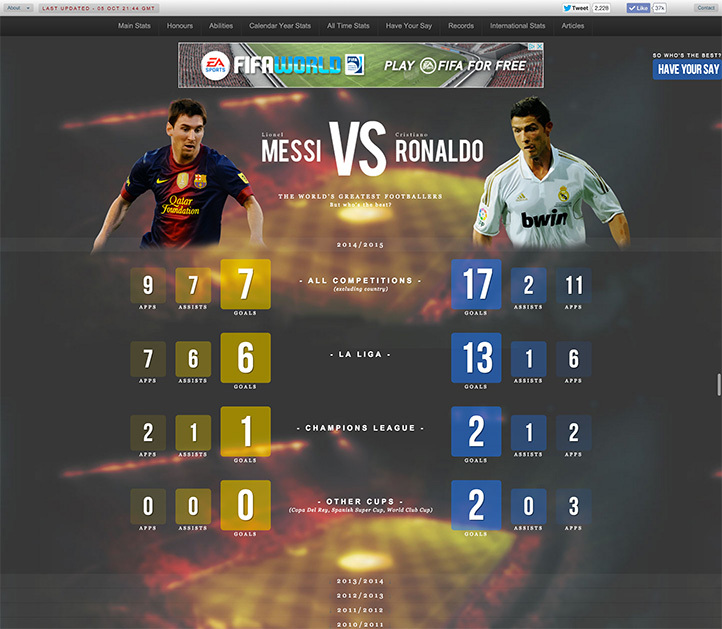 Messivsronaldo.net is listed as a reference in at least 2 Wikipedia pages – one being Cristiano Ronaldo’s and the other being a page specifically about the 2 players’ rivalry. Regarding search terms, the picture hasn’t changed much from last year’s review, albeit with considerably larger numbers. As I stated in my review last year, this website has an extremely varied demographic and is relevant to people of all types from all over the world – so I like to think it’s a fairly good measure of general browser usage trends today. 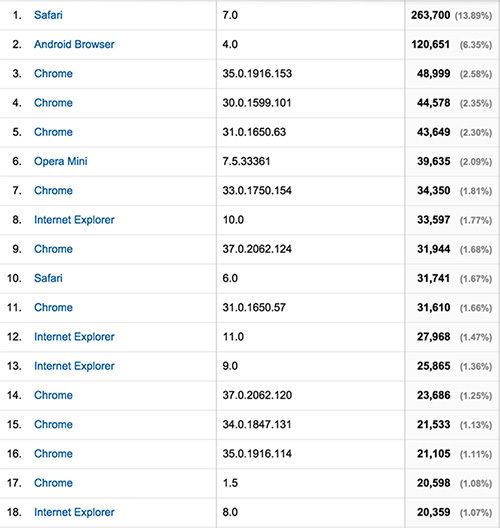 Fortunately for us web folk, the figures show the continuing decline of the troublesome old Internet Explorer browsers, with Chrome and iOS Safari fast becoming the standout major players. It also shows the further decline of Firefox, once IE’s biggest threat. Most of the world might be more interested in the battle of Messi vs Ronaldo, but for us web geeks it’s all about Mobile vs Desktop! This was a major point of the discussion last year, as combined mobile/tablet usage went from 23% in May 2012 to having a majority share of 51% by October 2013. And this trend has showed no signs of slowing over the past 12 months. For the entire year (from October 2013 to October 2014), combined mobile/tablet usage comes in at 58% to desktop’s 42%. However, if we take a look at the last 3 months, the figures are 64% mobile/tablet to 35% desktop. That’s not far off a 2:1 ratio in favour of mobile and tablet usage! Thank god I finally made the website responsive! Monetising messivsronaldo.net was never my primary aim, but gaining some kind of income from this site is certainly desirable considering the on-going work and time I’ve invested. Fortunately, this side of things has picked up quite significantly in the past 12 months; obviously a side-effect of the increase in traffic. The home page now features 4 Google ads (one above each section) and there is one at the top of each page. Between October 2012 and October 2013, the adverts made a grand total of £382! It covered hosting costs of course but at an average of £32 per month, it was hardly going to pay the bills! The figure for the past 12 months, from Oct 2013 to Oct 2014, is £1,025; an increase of 268% on the previous year! At an average of over £84 per month, this is now a very welcome addition to my monthly income. It pays for a night out at least! As of last October, my best month for revenue brought in £50. These days, monthly revenue figures with 3 digits aren’t uncommon, with the highest being £152 in June of this year. This October (2014) looks set to record another new high, with £43 earned so far after just 6 days! In terms of additions to the site, I think I’ve almost reached a limit with all of the new pages and data that I’ve implemented in the past year. Ideally, I’d like to provide even more in-depth information, such as free-kick and penalty statistics, goals scored with the left/right foot and so on. But this kind of data is extremely difficult to come by – especially free/accurate data. My most recent addition – the blog – was implemented with the aim of providing a space to take the analysis into more depth, but it’s early days on that front so we will see how that goes. Ultimately, it remains evident that Messi and Ronaldo are both light years ahead of everyone else playing the game today – and Ronaldo appears to have stepped his game up yet again this season, so thankfully for me, messivsronaldo.net should have at least a few more years left in it yet.